Shallow RC drilling at the WAMA property returns intervals of 4m @ 30.57 g/t Au, 3m @ 19.39 g/t Au, 11m @ 3.16g/t Au, and 1m @ 76.5 g/t Au within mineralized vein system, identifies surrounding anomalies | Volcanic Gold Mines Inc.
September 18, 2017 – Vancouver, British Columbia – Volcanic Gold Mines Inc. (“Volcanic”) (TSXV: VG) reports highlights of exploration drilling at lands optioned from West African Mining Associates SARL (“WAMA”) in Guinea. To date, a total of almost 1,300m of reverse-circulation (“RC”), and over 4,000m of air-core drilling, have been completed at the WAMA property. 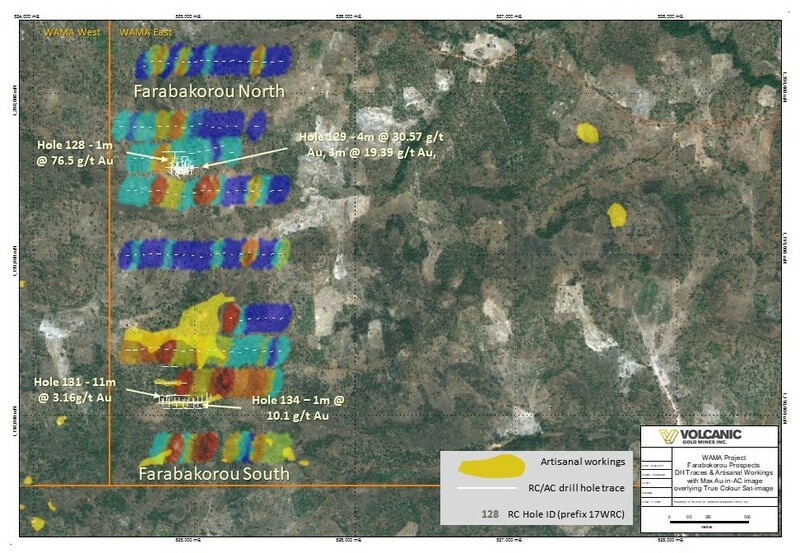 Drilling took place within, and in the immediate surroundings of an area of historic drilling and artisanal gold workings at Farabakorou, as announced on April 18, 2017. RC drilling by Volcanic confirms the presence of vein-hosted mineralized intervals proximal to those returned by WAMA. Air-core drilling beyond the original footprint of WAMA’s historic drilling reveals the existence of linear mineralized features over strike lengths of up to 1.5km (Figure 1). These are thought to represent the surface expression of underlying vein structures typical of the Siguiri Basin. Field mapping and interpretation of high resolution satellite imagery (Figure 2) has identified widespread evidence of artisanal gold mining activity, which elsewhere is known to indicate close proximity to bedrock gold mineralization. Such artisanal gold mining activity is seen to project immediately southwards of a linear zone of artisanal workings 6.3km in length and up to 550m in width at Tadibakourou (announced on July 26, 2017), at which coarse gold has been recovered from numerous shallow pits and shafts. The workings identified on the WAMA property suggest a potential continuation of this feature. Further results will be reported shortly of drilling at Volcanic’s Yagbelen target at Mandiana, where field work remains ongoing. Certain statements contained in this news release constitute forward-looking statements within the meaning of Canadian securities legislation. All statements included herein, other than statements of historical fact, are forward-looking statements and include, without limitation, statements about the Company’s plans for the WAMA and Mandiana Projects. Often, but not always, these forward looking statements can be identified by the use of words such as “estimate”, “estimates”, “estimated”, “potential”, “open”, “future”, “assumed”, “projected”, “used”, “detailed”, “has been”, “gain”, “upgraded”, “offset”, “limited”, “contained”, “reflecting”, “containing”, “remaining”, “to be”, “periodically”, or statements that events, “could” or “should” occur or be achieved and similar expressions, including negative variations. Forward-looking statements involve known and unknown risks, uncertainties and other factors which may cause the actual results, performance or achievements of the Company to be materially different from any results, performance or achievements expressed or implied by forward-looking statements. Such uncertainties and factors include, among others, whether the Company will negotiate a new agreement with WAMA and whether the Company’s exploration work on the Mandiana Project will continue as planned; changes in general economic conditions and financial markets; the Company or any joint venture partner not having the financial ability to meet its exploration and development goals; risks associated with the results of exploration and development activities, estimation of mineral resources and the geology, grade and continuity of mineral deposits; unanticipated costs and expenses; and such other risks detailed from time to time in the Company’s quarterly and annual filings with securities regulators and available under the Company’s profile on SEDAR at www.sedar.com. Although the Company has attempted to identify important factors that could cause actual actions, events or results to differ materially from those described in forward-looking statements, there may be other factors that cause actions, events or results to differ from those anticipated, estimated or intended. Forward-looking statements contained herein are based on the assumptions, beliefs, expectations and opinions of management, including but not limited to: that the Company will negotiate a new agreement with WAMA; that the Company’s exploration work on the Mandiana Project will continue as planned; that the Company’s stated goals and planned exploration and development activities will be achieved; that there will be no material adverse change affecting the Company or its properties; and such other assumptions as set out herein. Forward-looking statements are made as of the date hereof and the Company disclaims any obligation to update any forward-looking statements, whether as a result of new information, future events or results or otherwise, except as required by law. There can be no assurance that forward-looking statements will prove to be accurate, as actual results and future events could differ materially from those anticipated in such statements. Accordingly, investors should not place undue reliance on forward-looking statements. 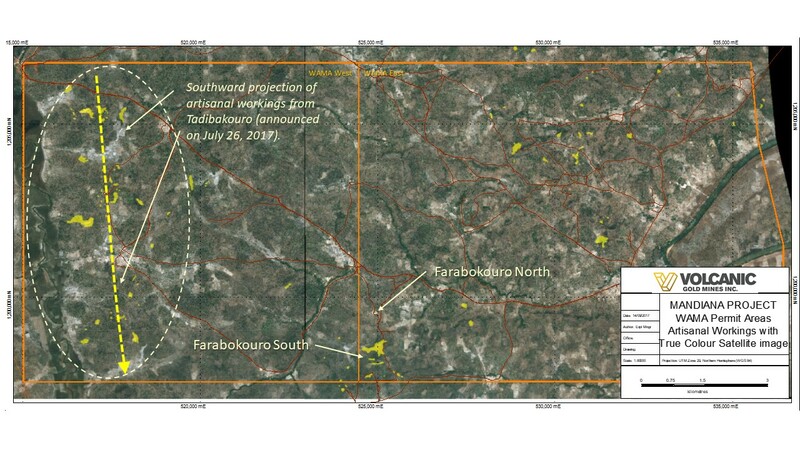 Figure 1: Drilling results from Farabakorou. Figure 2: Distribution of artisanal workings on the WAMA property.